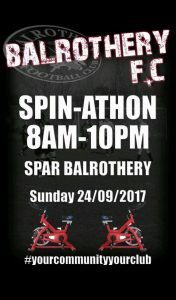 Today is our annual spin-athon fundraiser outside Spar in Balrothery. We will be there from 8am to 10pm so please drop by to show your support to all the wonderful people taking part throughout the day. Be sure to drop by in your club colours for some photos. The recent table quiz fundraiser was a huge success. Many many thanks to all who took part, sponsored and donated prizes. Thank you to the great job done by Mick and Reg, very professional. With the backing of such a great community the Club will go from strength to strength. The target was met and exceeded. 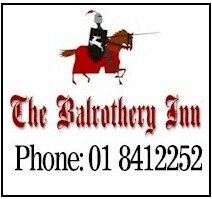 BALROTHERY FC ARE HOSTING A TABLE QUIZ IN AID OF THE JUNIOR KNIGHTS. PLEASE SUPPORT THE FUTURE OF THE CLUB. ALL JUNIOR MATCHES PLAYED AT CASTLELANDS COMMUNITY CENTRE. Over 35’s away to Loughshinny 11am. A massive thank you to Kevin and staff in Balrothery Pharmacy for kindly sponsoring The Club with First aid kits for all our teams. 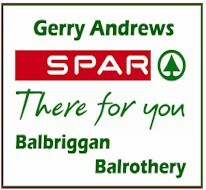 Gerry Andrews from Spar Balrothery for kindly sponsoring two of our underage team jerseys. Robert Pendleton from Apache pizza kindly sponsoring the other. We hope all our members and indeed the wider community support local businesses. The Club have recently secured a deal with Balon Sports for all our official merchandise. Check out our online store for great deals!